By studying the problem statement in Textual Analysis, you can extract words or phrases that are relevant to the system and convert them into model elements, such as classes, use cases (system goals) and action, etc. Those objects are regarded as candidate objects. You can extract words or phrases from problem statement to become specific type of candidate objects and edit their properties when necessary. Highlight the word/ phrase from the problem statement and select Add text as [model element type] from the pop-up menu. 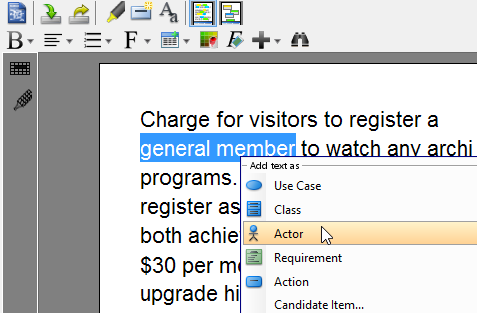 You can rename candidate objects, change their type, write their description and change their color of highlight in the grid at the bottom of textual analysis. 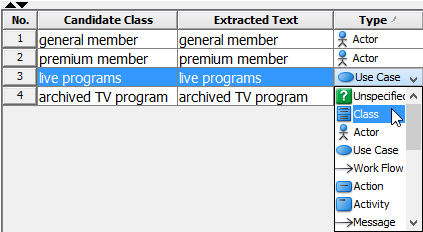 Double click on the Candidate Class cell and rename the candidate object. Double click on the Type cell and select a type from the combo box. 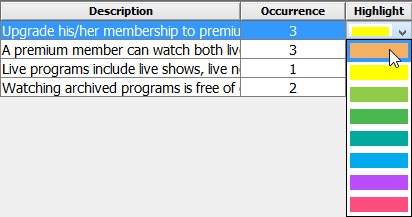 Double click on Description cell and type text inside the cell. Note: The text you typed in Description cell will become the documentation of the corresponding model element. Click the Highlight cell and press the inverted triangle. Select a color from the combo box.